Received: November 15, 2018; Accepted: November 21, 2018; Published online: December 30, 2018. A 72-year-old Korean male with an atrophic surgical scar on the forehead was treated using a combination of picosecond-domain, 1,064-nm neodymium-doped yttrium-aluminum-garnet laser with a fractionated beam profile and an intradermal injection of polynucleotide gel. At the follow-up 2 months after the sixth treatment, a significant improvement in the scar was observed. We suggest that the use of fractional picosecond-domain lasers in combination with injectable wound healing accelerators can be a safe and effective treatment for atrophic surgical scars. The use of picosecond-domain pulses is considered to offer qualitatively different tissue effects than earlier-generation lasers for scar treatment. In contrast to conventional fractional photothermolysis which aims to produce thermal coagulation columns in the skin, a picosecond-domain laser using a fractionated beam profile creates numerous microscopic cavitations in the skin without significant thermal injury.1 Recently, various wound healing accelerators such as stem cell culture media, platelet-rich plasma, and polynucleotide are getting more popularity in wound and scar management although their efficacy and safety have not been fully evaluated.2 We report a case of a Korean male patient with deep atrophic scarring of the forehead successfully treated with a six treatment of fractional picosecond laser and intralesional injection of polynucleotide gel. A 72-year-old Korean male patient presented with scarring to the right side of the forehead and the scalp (Fig. 1A), which had resulted from surgical repair of a traumatic full-thickness laceration 10 weeks prior to presentation. The linear scar, extending from the right eyebrow to the scalp, was linear 7.5 cm long, atrophic, and slightly erythematous. The patient had no history of any active management of the scar. The treatment area was anesthetized using a eutectic mixture of local anaesthetic cream (EMLATM, Astra-Zeneca AB, Södertälje, Sweden) for 30 minutes and cleansed with 5% chlorhexidine gluconate antiseptics. A treatment with a picosecond-domain (450 picosecond) 1,064-nm neodymium-doped yttrium-aluminum-garnet (Nd:YAG) laser (Discovery PicoTM; Quanta System, Varese, Italy) was started. Laser irradiation was performed using a round, 8 mm fractional microlens array handpiece at a fluence of 0.7 J/cm2. Multiple passes were applied on the lesion until the endpoint of significant petechiae. Immediately after laser irradiation, long-chain polynucleotide gel (RejuranTM; Pharma-reasearch Products, Seongnam, Korea) at a concentration of 20 mg/mL was injected at the base of the scar. Injections were performed with a 33-gauge needle and a serial intradermal puncture technique. About 0.05 mL of material was injected in each point and total 10 points were injected into the entire lesion. After wet dressing with physiologic saline, a hydrocolloid dressing (Duoderm Extra ThinTM; ConvaTec, Deeside, UK) was applied to the treatment area for 5 days. Petechiae were significant but disappeared spontaneously within a week. Mild, transient pruritus was noted 3 days after the procedure. The treatment was repeated at 3-week intervals for six sessions (Fig. 1B). No significant adverse effects were reported throughout the treatment period. A 2-months follow- up visit after the sixth treatment revealed a significant clinical improvement (Fig. 1C). Traumatic lacerations occur most often on the face and scalp and more than 50 percent of all lacerations are caused by blunt injury.3 Although most traumatic laceration wounds are caused by shear forces, compressive forces cause more devitalization of tissue, and therefore crush wounds are more susceptible to infection and unacceptable scarring.3 For atrophic scars, fractional lasers, which create noncontiguous columns of thermal injury surrounded by zones of viable tissue that allow residual epidermal and dermal cells to contribute to rapid healing, are more frequently used than the traditionally used lasers such as carbon dioxide and erbium:yttrium-aluminum-garnet lasers currently. Recently an innovative fractional lens array, which helps deliver laser energy into highly focused areas in a grid pattern, has been applied for picosecond-domain lasers to produce very high beam energies. This approach exploits laser-induced optical breakdown of skin tissue to achieve fast and efficient skin remodeling.1 Efficacy and safety of fractional picosecond laser treatment of atrophic acne scars have been reported under the wavelength of either 755 nm or 1,064 nm.4,5 Because the surgical scar of our case was more fibrotic and more extensive than atrophic acne scars, we used intralesional injection of polynucleotide gel in conjunction with the use of fractional picosecond laser, given that adjuvant administration of polynucleotide gel along with conventional fractional laser treatment has been found to lead to more favorable effect in wound healing and post-operative scar prevention after thyroidectomy.2 In our patient, a good result was found by combined use of picosecond-domain laser pulses and polynucleotide gel for atrophic surgical scars. We think that this case report adds to the literature on the efficacy of fractional picosecond Nd:YAG laser in treating atrophic scars. The authors also suggest that the adjunctive use of polynucleotide gel may further facilitate dermal remodeling after laser scar revision procedures. Fig. 1. 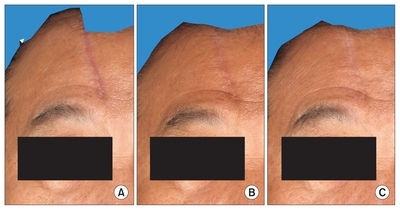 (A) A linear, atrophic surgical scar on the right forehead of a 72-year-old Korean male, (B) the patient’s scar after 3 treatments of a picosecond-domain 1,064-nm neodymium-doped yttrium-aluminum-garnet with a fractional beam profile followed by intradermal injection of polynucleotide gel, (C) a 2-months follow-up visit after the sixth treatment revealing a significant improvement of the patient’s surgical scar. Habbema, L, Verhagen, R, Van Hal, R, Liu, Y, and Varghese, B (2013). Efficacy of minimally invasive nonthermal laser-induced optical breakdown technology for skin rejuvenation. Lasers Med Sci. 28, 935-40. Kim, JH, Jeong, JJ, Lee, YI, Lee, WJ, Lee, C, and Chung, WY (2018). Preventive effect of polynucleotide on post-thyroidectomy scars: a randomized, double-blinded, controlled trial. Lasers Surg Med. 50, 755-62. Singer, AJ, Hollander, JE, and Quinn, JV (1997). Evaluation and management of traumatic lacerations. N Engl J Med. 337, 1142-8. Brauer, JA, Kazlouskaya, V, Alabdulrazzaq, H, Bae, YS, Bernstein, LJ, and Anolik, R (2015). Use of a picosecond pulse duration laser with specialized optic for treatment of facial acne scarring. JAMA Dermatol. 151, 278-84. Bernstein, EF, Schomacker, KT, Basilavecchio, LD, Plugis, JM, and Bhawalkar, JD (2017). Treatment of acne scarring with a novel fractionated, dual-wavelength, picosecond-domain laser incorporating a novel holographic beam-splitter. Lasers Surg Med. 49, 796-802.